My name is Gwyneth and I have three children. I was diagnosed with RP around the age of 30 and my youngest son, Sean, was diagnosed at the age of 11. We are now 54 and 23. I was the youngest of five children, and growing up I always knew my mother was almost totally blind but didn’t realise it was due to a genetic condition. It wasn’t until I visited an optician with my four year old daughter for an eye test (I had my eyes tested to show her it was ok), and I was referred to the eye infirmary for further tests that we realised I had retinitis pigmentosa. Things started to make sense. I wasn’t clumsy after all and other people really could see in the dark! After years of coping with RP I realised the time had come to think about using a long cane. I had dreaded this moment but after a series of falls I decided I had to learn to use the cane. I also felt I needed to set the way for my son to show that getting help was ok.
During my training I realised only close family and friends actually knew I had sight problems, and I was a little reluctant to start explaining my condition to everyone else. Whilst talking to my daughter about my concerns I jokingly said I need a way to ‘come out‘ to everyone about my sight and my cane so I don’t have to keep telling everyone when I see them. That’s when I had the idea of doing something for Retina UK (formally known as RP Fighting Blindness) as a way to tell everybody and also explain what RP was. We decided to see who would be interested in doing a walk for the charity and because one of the symptoms is night blindness we decided to do it in the evening. We thought the best way to get people interested was to meet and finish in our local pub, so my husband and I worked out a 3 mile route around the pub, and RP WALK WITH ME A WALK IN THE DARK was born! The first walk was in July 2016. We got in touch with the charity and was given leaflets, t-shirts, collection buckets and simulation specs and lots of advice and encouragement. 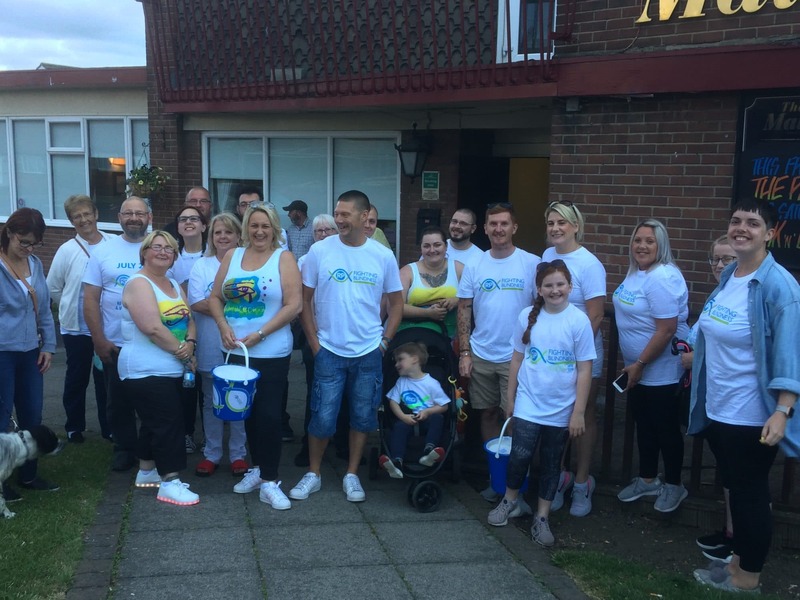 Initially it was more for awareness than fundraising, but we soon realised that some people wanted to sponsor us or collect sponsorship themselves, and others were willing to make a donation to come along on the walk. I also set up a Just Giving page and a Facebook page to keep everyone informed about plans etc. That first year we raised just over £500, got an article about us in our local newspaper and had a great night! I thought it would be a one off event but the next year people started asking me if we were doing the walk again as they’d had a great time. So we did it again and raised £575! I was truly shocked that everyone got behind it again! Again last year people started asking when the walk was. After a chance comment from my daughter, my husband agreed to do a live chest wax in the pub after the walk, and with the help of the landlord and the beautician from my local nail salon (both of whom support the walk and are friends of ours) this was arranged, and that year we raised a whopping £755! So again we are planning this years’ walk with a little extra. My daughter and I are applying to break a word record for the most soft toys thrown and caught in one minute blindfolded in a team of two! It started as a way to let people know about my sight problems and spread awareness for RP. It has been amazing, and each year I am more and more stunned that people want to support me. I will continue to do it for as long as people want to come along.